Two-M Precision, Inc. has a variety of capabilities and uses modern CNC machining and grinding equipment for production. The photos below describe the machinery we use and our capabilities in more detail. 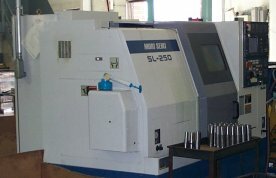 We have numerous Mori Seiki CNC turning centers with the capacity of 16" OD x 21" Lg. This Mazak CNC turning/milling center with full C-axis is capable of turning a 21" diameter part a full 60" in length. The machine's full C-Axis allows us to mill splines or any other shape to the part. This is a Viper VMC 3032. The Viper travels: 121" x 32" x 26". This is a precision heavy duty #50 taper CNC milling center. It is equipped with a 35 hp motor that delivers 6000 RPM. Copyright 2000, Two-M Precision, Inc. Willoughby, Ohio USA.